Last night, I had a 3 1/2 hour music session with a friend I’ve been visualizing singing with for a couple years now. Finally, our calendars finally lined up with some spare time. In my studio (kitchen) I had Spotify, youtube, the “Ultimate-Guitar” app, iphone, five binders full of paper “Books of Dreamz” tab, appleTV, my Martin Guitar, JamMan loop pedal, Bose L1 PA, Scottie Dog “Dexter”, kettle and tea bags, a Hungarian au pair, and a few cell phones all in sync and in top form. We came up with about 12 songs for a set we could have “pub ready” very soon! Loads of stuff I’d never really played before in a bluesy and jazzy and in a “perfect pitch” way. From KT Tunstall to MJ to Coldplay to The Commitments. I’ll tell you what…you see a lot about diet, exercise, medical innovations, alternative medicine, meditation, etc (and they are crucial to fighting cancer)…but for me, nothing lets me escape dealing with cancer like playing music! I guess it all started wIth carcinoid syndrome that hadn’t been diagnosed. Over the next few posts I’m going to cover that time period until now. Where presently, I gig a couple times a month with my band “The Acoustic Supper Club”. 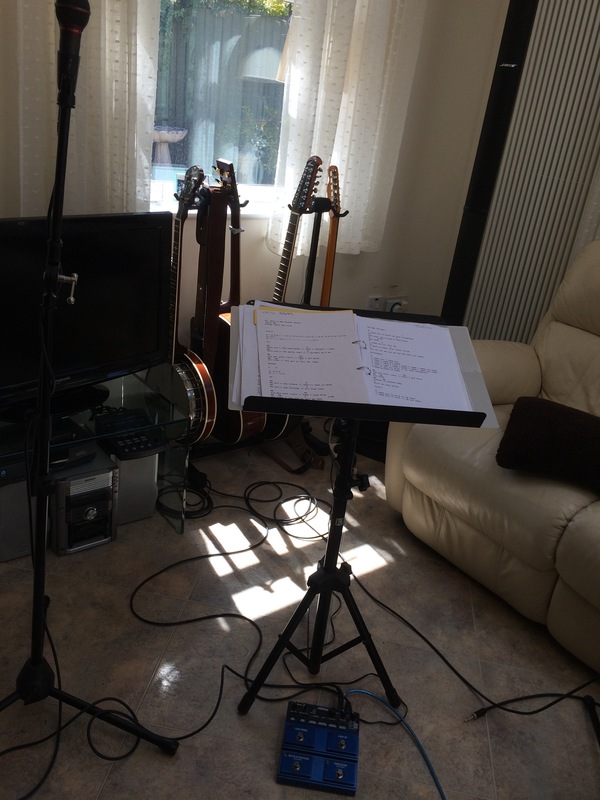 The gigs are fun, but it is the sessions where we jam on new music I really enjoy. I think I’ve finally figured out what I can bring to the blog world. Stay “Tuned” (pun intended)… Ok, that’s it…time to post! I’m on day 15 of my personal 182.5 challenge, and I’m certainly feeling benefits already. Feel good, thinner, think I can see a difference in my face, have’t blown a day on MyFitnessPal, have convinced Les to start, and feel good in the routine. It has also been over a week since round 2 of PRRT Lu-177. And, this week has been a lot easier than after round 1. My morning blood sugar results have been really good as well averaging around 8.0. The best test to see how well you are managing your diabetes is thr HbA1C test, but that can only be done every 60 days or so. I want some daily feedback. So, I take a morning glucose level before I eat anything. Visualuzing and aiming for 8 at 8am. No science really, but I’ve noticed that I feel good with that score. 4-8 being “normal”. I’ve not cut anything out of this diet, except refined sugar and processed foods. I eat a lot of salad, I’ve started eating fruit again (blueberries, cherries, oranges), honey, real milk, eggs, and some red meat (but a lot less) but mostly white meat and fish. Plus, some potatoes, pasta, and wholegrain bread. These are good fuel foods. I’m learning that all sugars are not bad, and for me I think it is pretty important to layer the carbs and protein to stay level through the day. Staying level helps a lot with reducing cravings. One of my blood test scores I think I can improve is on Vit D. It only 50, which is boderline deficient. I’ve been taking a supplement, but after reading Vitamin D & Cancer Prevention and Battling Cancer I’m convinced suplements help but you really need good UVB rays from the sun to get the levels up in the 70-100 range. My next challenge to myself. Might see me at the tanning salon. From what i’ve read, 20 to 30 mins of midday sun on large areas of skin gets you the good rays (UVB) turned into Vit D and topped up to good levels after a few weeks. The few articles I’ve read indicate you can’t do it with diet or supplements alone. Makes sense to me. Overexposure to the sun (harmful UVA rays) is still bad though. Recommend you read the article linked above. Interesting relationship between gout and Vit D as well Gout & Vit D. So, Vit D can help me in a few ways! My Uric acid score is 460, and that is a month after my first gout attack. My first Uric acid score a couple weeks ago was 438. Weird, since I’d expected it to drop with how extra healthy I’m eating. I think this may be a result of the treatment and it might be a good number (cell recovery after radiation). So, I will still limit foodsthat are high in purine, but expect this score to be much better at the 182.5 point. I ran it last year, and Lesley ran at least as far as I did to spot me at several locations. Lately, she’s lost a bit of confidence in how strong she is, and I’m hoping this is a real boost to her as our whole family needs her strength. And, when I say “whole”, she needs it as well. I’m sitting in a hospital waiting for the 2d round of Lu177 PRRT for NET Cancer. It is a £16,000 shot designed to stun the tumors around my body. I’m quite a lucky boy really! This treatment isn’t available in the US yet, only in clinical trials. My consultant is one of the world leaders in the treatment of NET cancer. So why 182.5? Well, if this treatment is going to have its best chance of working I need to be in the best physical shape possible. My ideal weight is 182.5lbs. Aka 83KG AKA 13 stone. Also, 182.5 is exactly half a year…so, my reptilian brain should be assured of survival after 6 months of getting there. 1st Post – Live Boy! Over five years ago I was scared. As my wife and I sat in the Dr’s office I thought I’d heard the death sentence as it was explained that carcinoma was indeed cancer. From there, it has been one hell of a roller coaster ride. But, I’ve learned it is not necessarily so. It is a “life” sentence, but that ain’t all bad! I hope this blog helps me capture some of the stories with the emotions and lessons learned. I plan to write about what I’ve learned. What I did or am doing about the obstacle or opportunity. I plan to write about my views health, finding a Dr., relationships, diet, exercise, depression, inspiration, music, and things that matter to me.